The Hitec HS-300 Apollo servo, left, offers 42 oz-in of torque at 4.8V, and the HS-55 micro servo, right, 15.2 oz-in. The propeller produces thrust and pulls the model airplane through the air, but what makes a model turn to the right or left, or rotate its nose up for a climb or down for a dive? The control surfaces—the ailerons deflect to make the airplane roll, the rudder moves to cause the aircraft to turn (yaw) to the right or left, and the elevator moves up or down to pitch the nose up or down. What moves the control surfaces? Servos. 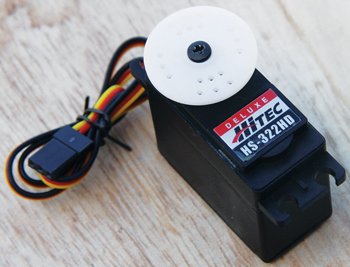 The Hitec HS-322HD servo weighs 1.5 oz. and is 1.57 X .78 X 1.43in. in size. 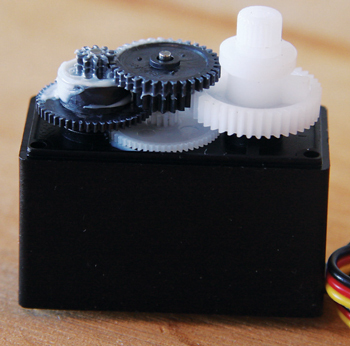 With the output horn and top of the servo case removed, the tough plastic gear train is revealed. Servos are small, rectangular black plastic work-horses with wheels or horns (we will call them horns) on the top and wires that plug into the receiver in the airplane. Two wires in the three-wire strand power the motor in the servo and one carries the “signal” that tells the servo how far to rotate its output horn. In addition to moving control surfaces, servos can be used to lower landing gear, move a canopy back, release a bomb, flip an onboard switch to turn lights on or off or power up the motor system, and more. Servos offer proportional control of the things they move. An example is pulling the nose up to enter a climb: Pull back on the right stick just a little, and the elevator servo will raise the elevator control surface a small amount, causing the airplane to pitch the nose up slightly. Yank back on the stick aggressively and the elevator will deflect upward decisively, sharply pitching the nose up. This shows proportional control. Servos have gear trains in them that enable them to produce ample torque. Torque is rated in ounce-inches, which is a measure of the force exerted by the control horn an inch out from the output shaft. 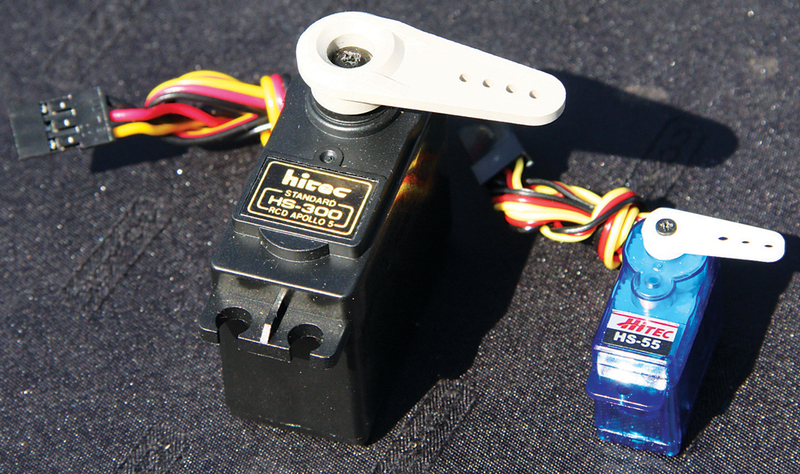 The $10 Hitec HS-322HD standard servo produces 41.7 oz-in of torque when powered by 4.8V and slightly more force if it is powered by a 6V power supply. Another metric often applied to servos is the speed it takes the servo to rotate the horn through a 60° arc. The HS-322HD takes .19 seconds to rotate its output horn 60 degrees. Standard “analog” servos like the Hitec HS-322 are affordable ($10) and reliable, and depending on the brand, only consume 250 to 700mA of power when in operation. “Digital” servos can provide much higher output torques for larger models—often in the 150 to 300 oz-in range. They consume a lot more power. When ganging a lot of digital servos, modelers will consider the total power consumption, but the use of three or four standard servos typically poses no power issues for a trainer. The best way to install servos, if you are scratch building, is with the shortest slop-free linkage possible—we will address that in another column! Good Flying!